LCOs can eliminate grassy weeds without hurting turf any time during the season to maintain customer satisfaction – and business – into the new year. Finding an herbicide to use for postemergent grassy weed control can be a challenge for lawn care operators (LCOs). Lane Tredway, technical services manager for Syngenta, says the new Manuscript herbicide, featuring the active ingredient pinoxaden, is going to be a good resource for LCOs, as part of a season-long program, to ensure their clients’ lawns are weed-free and they’re renewing their programs year after year. “Manuscript is going to be a welcomed addition to the toolbox,” he says. 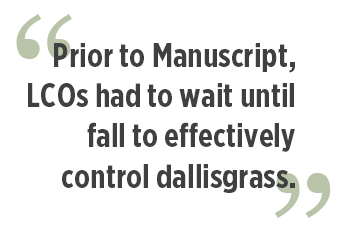 Manuscript offers postemergence control of weeds, including crabgrasses and dallisgrass, in Bermudagrass and zoysiagrass. In 90- to 100-degree heat, many herbicides can exhibit side effects on the desirable turf, says Shawn Emmack, Mid-South U.S. territory manager at Syngenta. Manuscript doesn’t do that. “You want to be able to apply a product that’s going to work on the weeds but not damage the lawn,” he says. Left: Dallisgrass weeds in Common Bermudagrass the same day as the first application of Manuscript herbicide. Right: Common Bermudagrass unharmed by Manuscript surrounded by dead patches of dallisgrass, ten days following application. Photos: Shawn Emmack, Syngenta. Weeds that germinate in early spring, such as crabgrass, get bigger and more difficult to control throughout the summer. Typically, LCOs are limited to only controlling young crabgrass plants. With Manuscript, LCOs can control small plants all the way to mid- to late-summer, Tredway says, adding that Manuscript is a supplement to preemergence herbicide programs or a rescue option for where a preemergent failed or wasn’t applied. Sometimes LCOs inherit a yard or acquire a new customer mid-season, and that yard may not have had any herbicide treatment before, so it’s full of weeds. Syngenta has done many trials across all segments of the turf industry, including the southern U.S. and the transition zone. Numerous test trials were conducted in southern U.S. this past summer that showed Manuscript’s good foliar absorption, according to Emmack, who oversaw about 10 trials in his region. He noted the product may be applied any time of year, but the best control comes in the spring and fall. Left: Crabgrass weeds in Common Bermudagrass the same day as the first application of Manuscript herbicide. The herbicide is packaged with Adigor, a surfactant that was specifically developed to enhance the performance of Manuscript. According to Tredway, the surfactant increases and speeds up the absorption of Manuscript’s active ingredient into the target weeds. The herbicide is mostly foliar absorbed. “If LCOs get a rain storm during the day, they can be more certain that enough of the active ingredient has been absorbed before the rainfall washes it off,” Tredway says. Another benefit of the absorption rate is that LCOs don’t have to rely on the homeowner to water in Manuscript or wait for natural rainfall to come along. 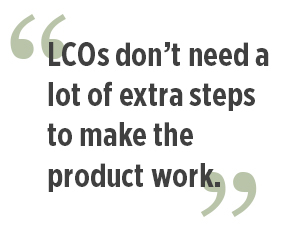 “LCOs don’t need a lot of extra steps to make the product work,” Emmack adds. For additional resources to help your business grow, visit GrowWithSyngenta.com. To learn more about Syngenta, visit www.greencastonline.com.